Sean Dyche admitted some of his players were lacking an "edge" after seeing his side knocked out of the FA Cup by National League leaders Lincoln City at Turf Moor. The Clarets lost out to an 88th-minute header from Sean Raggett, as the non league side claimed a deserved Premier League scalp. 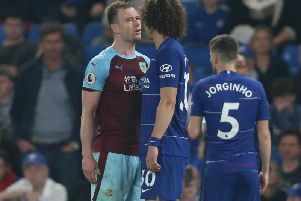 Dyche helped giant killers Chesterfield to an FA Cup semi-final 20 years ago, but the boot was on the other foot: "We've unfortunately played part of their fairytale, which we quite obviously didn't want to do. "I saw them last week, very similar gameplan, back four don't go anywhere, front two work hard, and play up to the big man. And we dealt with it lot, to be fair, because there is a sensationalism in these moments, but as a manager, I know what we dealt with, and I think they had one chance - their goal. "I'm not too critical about the shape and defensive side of the team, the technical detail...we created enough to score a goal, we didn't do that, we haven't kept the ball as well - the pitch is a bit tricky at the minute, because of the weather up here. "But no excuses. At the end of the day, I've been on the other side, in a team that had to find a way to win a game in this competition, and they found a way. "That's what football is all about, you have to find a way." Burnley weren't quite themselves, pretty much from the off, and, asked whether his side got going, Dyche added: "Not as much as we normally do, I was happy with the team selection, I thought there were enough individuals with enough quality. It was a tricky one, the conditions were a bit awkward, the growth of the pitch is tough. "I don't think we were near our levels, but still enough to get the job done if we take our chances. "We've found before many times, particularly in the Championship, when teams play a back four and don't move, when you score that first goal, that changes everything, and we didn't do that. "It's one of those things. "If you keep any team to no chances on your goal, and one in the dying moments, that's a solid performance. But with the ball, the detail was lacking." But he knocked down any suggestions that complacency was an issue: "Its far too simple to say that, no complacency on our part. You're looking to make a story about that sort of things, and I spoke about it, I've been the other side of it, so there's no complacency, I bet our stats were good physically, but it's the detail of the performance, particularly with the ball." Joey Barton was involved in a moment of controversy, appearing to make the most of minimal contact from Lincoln striker Matt Rhead, before being booked for his part in an incident which saw Terry Hawkridge go to ground. But Dyche said: "He was terrific, he kept us going, kept us right, plays with that energy and desire. There were a few lacking that edge I talk about...part of our growth is this is the first time in a long, long, time that we've been favourites, big favourites. "It's a different mindset. Virtually every week we are underdogs, and I didn't think we dealt as well with that once the whistle blew. In the week, fine, build up, habits, everything good. But the madness of football is we take a chance early, and it changes everything. "We didn't, and one of my mad laws of football is the law of one more chance, and they had one, and took it."